It is useful to know what your audience thinks about you but without an analytics platform, keeping track of what is going on can be overwhelming. Basic metrics tracking is provided in several social platforms that care useful for marketers. Seeing how others are responding to a post that has been shared across the network can be an incentive for users to keep sharing the post. Rewards are created by platforms to keep users engaged on the platform. These rewards can take the form of reputation enhancements such as badges, tallies of user approval such as “likes”, or other emotions (found on Facebook’s reactions emoji bar), and “retweets”). There are also and indicators of user recommendation on promoted posts which can be upvoted or downvoted on social platforms such as Reddit, Metafilter, and Slashdot. All of these rewards systems have been created by social media platform designed to keep people active on their services. These public displays of activity are very valuable to the marketing team, who can understand how well their message is getting across to the user base. It can also, show how their online customers feel about them and whether they are satisfied, or dissatisfied with the marketing activity as a whole. The problem for the marketing teams is that the amounts of comments and social shares can sometimes overwhelm. With platforms that have a large user base and a continually updating front end It can become impossible for anyone to keep up with the stream of tweets. As Twitter has permitted only certain companies a license to access its data, trying to find out what the user sentiment happens to be, or extracting meaningful analysis can be difficult. The marketing team will need to consider using a platform that is licenced to access the stream and has a useable dashboard to view metrics from a range of different social platforms. Analytics platforms should be able to aggregate the data from your marketing efforts and deliver it in real-time and an easy-to-read format. It should be able to display visualizations and summaries for executives and should be configurable should you want to dig deeper into the data. Make sure you choose an analytics platform that is able to measure the aspects that matter to you, and does not merely duplicate information that you can get from the social media platforms themselves. Being able to tailor the analytics platforms to do deeper research studies around the business customers’ behaviour can be an invaluable feature that will reward the amount of effort made . There are hundreds of free and paid for social analytics platforms and tools across the web. Many of them do a single task such as measuring conversions, or traffic to a website. Others perform a variety of tasks. If you want to calculate video views, or measure your social media traffic, or how your social sharing is driving conversions, then you need to do your homework to get the most suitable tool. There are commonalities and techniques that cross most platforms Tools and measurement technologies will come and go, and you will need to keep abreast of the latest developments in monitoring tools. What is important however, is understanding the frequency, quality, and effectiveness of your connection with the customer. Here is a list of some of the many thousands of analytics platforms that might be useful in your campaigns. Birdsong Analytics http://www.birdsonganalytics.com/ Pay-as-you-go social media reports for Twitter, Instagram YouTube and Facebook. Brand 24 https://brand24.com/ Brand mention analytics with influence score and sentiment analysis. Crowdbabble https://www.crowdbabble.com/ Analytics platform for Facebook, Instagram, Twitter, LinkedIn, and Snapchat. Also analyses hashtags and competitors. GetSocial https://getsocial.io/ GetSocial tracks sharing not easily recognised by social sharing including private shares across Facebook, Twitter WhatsApp and email. Google Analytics https://www.google.com/analytics/ Digital data and marketing analytics to give a complete picture of the online customer. Justmetrics https://justmetrics.net/ Audience and follower analysis with post analysis and engagement metrics. Kuku https://kuku.io/ Social media management syndication platform and analytics to manage multiple social accounts. Lithium https://www.lithium.com Social media analytics platform that uses six ‘health factors’ to create an index-like credit score to analyse the health of your online community. Visibrain http://www.visibrain.com/en/ A media monitoring platform for marketers, monitoring brands, influencers and trends. This entry was posted in Analytics, Strategy on July 13, 2017 by eileenb. Customer relationship platforms have existed for many years. They are mainly focused on serving the customer in support issues. The sales team keep details of their prospects, leads and customers to help them manage relationships with potential customers. In support teams CRM platforms are used to gather statistics on which products or services generate the most customer complaints, and how long issues take to get resolved. Before the advent of web 2.0 – the interactive web – CRM systems centred around phone calls and postal mail. Today they integrate with live chat and email systems, and social media platforms. This entry was posted in Customer Relationships, Customer Service, digital marketing, Social Media Strategy, Strategy and tagged digital marketing, Marketing, Strategy on June 29, 2017 by eileenb. Not all businesses are well-suited for online marketing campaigns which often run alongside traditional marketing effort such as TV ads, print magazine inserts, postal mailings, or sponsorship of live events. Awareness of marketing techniques and traditional marketing resources can create an effect that works in both realms. Businesses have traditionally reached out to their customers to sell their products, using a range of options from free to very high cost. Word of mouth. A satisfied customer can often be the best advertising. Community of users – such as a book club, motorcycle or car club. Transferring these into the online marketplace can vary in success. Sometimes the cost is much less, sometimes there is a lot more work for the digital marketer to do. Theoretically there are no physical limits online – apart from the user’s attention span. Word of mouth. A new customer can hear about your product or service from their friends through Facebook, Twitter, Instagram, Pinterest, or Snapchat. This recommendation, can be very effective as the speaker on your behalf already has the potential customer’s trust. Favourable mention in a community publication. This could be an online forum where like-minded people gather Users are familiar with each other, trust is high because it is embedded in a topic that the users already care about. Online community of users can arise around your product or service itself. Fans of your line of gadgetry will be discussing your product with each other. This kind of community lets you offer previews, discounts, and announcements of new products or services they will want to purchase. Earned media. Sometimes there is a story around a product or service that makes the mention in a media channel fortunate for the business. This can work against the company, if a flaw in a product is discovered, but it is marketing that the company does not have to pay for directly. Paid advertising raises awareness, acquires customers, or convert people to a sale. Money has to be spent here, but you can plan your spend ahead of time. Careful planning and monitoring can assist with this. Paid endorsement or paid influencer recommendations. These require cash, careful management of the relationship, and early assessment of whether the celebrity is the right fit for the target audience for your product. The digital marketer needs to take on the challenge of mixing and matching these techniques in a way that best supports their business and gets them more sales. You will need to create your strategy and set goals, consider creating a digital marketing framework and choosing the best channels for effective reach. This entry was posted in digital marketing, Online Brand, Strategy and tagged digital marketing, Marketing, Strategy on June 14, 2017 by eileenb. Getting the right channel for marketing is an important key part of your overall digital marketing plan. Consumers see massive amounts of information each day across every device they use. in your digital marketing activities, you will need to consider which channel will be best for your campaign. Think about using more than one channel too and remember that it is important for a brand to have a consistent message. If a campaign is going to be delivered across a variety of channels, it is important that the message resonates across a variety of offline and online channels. Customers view the brand as a whole entity – whether they are in the shop, viewing the online store, or interacting with the brand on social media channels. Consistency across all different channels – online and offline – is vital to multi-channel success. A holistic view needs to be taken of all of your outbound and inbound channels. Which channel receives information? Carry out research to see which social platforms your intended audience currently use to receive information and tailor your message to suit. Short or simple messages might be most effective across social media, long or complex communications may need a different channel to be the most effective. Calculate the cost of communicating this message across each channel. Channels such as TV will be expensive, and some publishers will charge considerably more than others. Social channels can be populated at little or no cost, depending whether you pay for promoted posts or use the free channels. Define what response is required from this communication. Do you want to engage, or surface influencers, or assess customer satisfaction for the product. Make sure all comments are responded to in accordance with your defined framework. Advertising covers much more than social media advertising. If you think about apps that are delivered to Android, or Windows desktops, these apps can contain ads for your brand. In addition to traditional emails or SMS broadcasts, you could communicate through tablet apps or web sites, wearables, in-store kiosks, QR codes and RFID tags. Also consider partner or affiliate marketing – or use influencers to extend your coverage. Create a list of suitable channels in your digital marketing playbook and compare the performance of each one. Make sure that each channel has a set of services that map to your overall plan. The channel might need to have tools for customer relationship management, order management, product management, and issue management. If these are standardised, then you can easily adopt any new marketing channel that comes online. This entry was posted in Community, digital marketing, Social Business, Social Media, Strategy and tagged digital marketing, Strategy on June 6, 2017 by eileenb. You need to fully understand their audience. You should know its media habits such as which device they prefer to use – and when they use it. The online landscape changes rapidly so resources should be adjusted to suit. A listening audit should be carried our to make sure that the chosen channels in the marketing plan are the same channels the audience uses. A benchmark can then be set for each platform for the campaign with associated KPIs. The build phase of a campaign could be as simple as creating a content calendar, developing training for the team, or designing a creative brief for the agency. Whatever the build phase contains it is important that it ties in with the digital strategy and overall business strategy. Whilst a content calendar is easy to create, it often forms the core of all marketing activity. It might contain details on how many social media posts to create, or when to write a particular blog post. You should manage the differing types of content that goes on what channel, and when it should be posted. Customer engagement does not often run how the marketer predicts it will. You must set out how to respond when dealing with enquiries, information, complaints, dissatisfaction and customer anger. 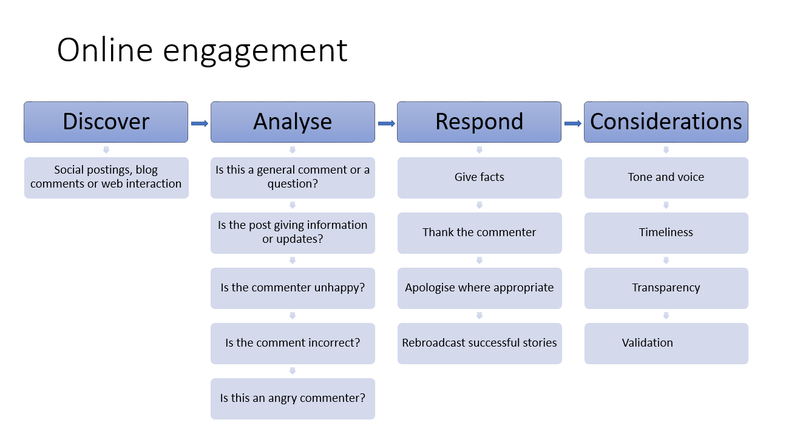 Each style of inbound comment, should be assessed for tone and manner, responded to and considered. The customer engagement framework therefore must take these situations into account. It is important to recognise the differing amounts of effort needed to produce content on different channels. Whilst it is easy to take a picture and upload it on social sites, full production videos with voice overs take considerable effort and should be built into the plan. Above all, your engagement strategy needs to be workable for your brand. Your primary goal is to encourage conversation. It is also important to track the metrics that show that the campaign has been successful. Often marketers focus on easily accessible metrics, such as followers, likes and shares. These metrics, whilst useful are not actually as important as other quantitative and qualitative metrics. Whether that metric is, make sure that each set metric matches the original defined objectives. If you want to understand what people think of your brand the stated objective is listening. Monitoring success is easy – but getting the correct measurements that actually mean something – is much harder than you think. Creating your all-up marketing campaign will take significant time, and resources. Maintaining, monitoring and optimising the campaign will take even more time. Make sure you plan for it to be a success.. This entry was posted in Crisis Management, digital marketing, Strategy and tagged crisis management, dital marketing, Strategy on May 28, 2017 by eileenb. If your marketing objectives are achievable and specific to the business, then the marketing team can focus on the objectives, and make appropriate decisions. The team can create priorities and channel appropriate resources to the objectives to ensure that they are met within a specific time frame. your playbook will have several sections – including one for your digital marketing strategy. As with all strategies and plans, details need to be fleshed out, so, you can deal issues in line with your overall strategy. Frameworks are varied and versatile. Some deal with customer engagement, some with crisis management and disaster recovery. 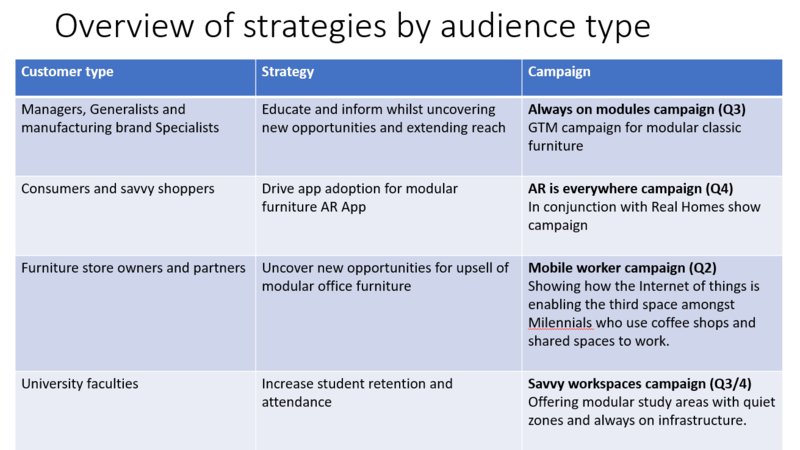 It often is of benefit to tabulate an overview of strategies and themes by intended audience type such as this example below showing strategies and campaigns for a furniture company’s line of modular furniture. You also need to make goals so you can focus your effort on the right method of communication. Goals need to be fixed, objectives identified and the correct channel identified. How will your strategy change your relationship with your customers in the short, medium or long-term? What resources do you need to carry out your plan? How will the new plan change relationships with your customers? What dependencies does your strategy have? How will you maintain this plan over time? How will you scale or replicate the plan? What internal or external blockers do you need to overcome to achieve success? What tactics, tools, or technologies will you use for your plan? What are the most important features required of each tactic or tool? What new skills or training do you or your team members need in order to succeed? What resources and processes will you need to mitigate these risks? Do you need an external vendor or partner to execute on the plan? What could go wrong with this plan? How can you minimise risks and avoid a potential crisis? There are a lot of things to consider when planning your strategies and campaigns. Getting it right now, will help you move your marketing activities forward smoothly and successfully. This entry was posted in digital marketing, Strategy and tagged digital marketing, Strategy on May 3, 2017 by eileenb.